Time Tracker Visual Timer & Clock For Kids | OhGizmo! 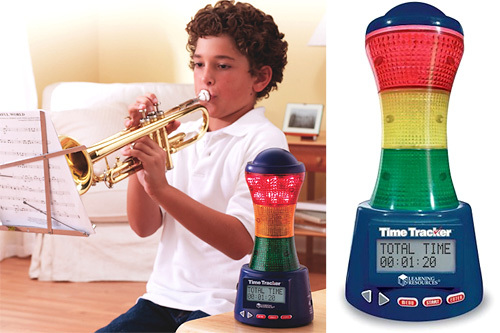 I feel sorry for the kid who gets stuck practicing the trumpet alongside this thing. Not only are they forced to learn an instrument, but they’re also being forced to learn time management skills. Goodbye childhood, hello paper route. Of course through the eyes of a parent, the Time Tracker probably seems like the perfect way to keep kids ‘on track.’ There are three sections that can be programmed to light up after specific time intervals, as well as six sound effects that can be used to indicate when time is running out. If anything, the Time Tracker at least puts an end to the “I didn’t know” excuse, since it looks pretty hard to misinterpret. You can find it on the Learning Resources website for $38.95. My children are on the autistic spectrum and I have found the time tracker device to be invaluable in helping them to make transitions between activities. They need advance warnings that what they are doing will be ending soon, whether it be playing a video game taking a bath or anything in between. The count down timer with the ability to set warning times provided by the time tracker makes it ideal.